The pink carpet has been rolled out for t 2018 Teen Choice Awards! 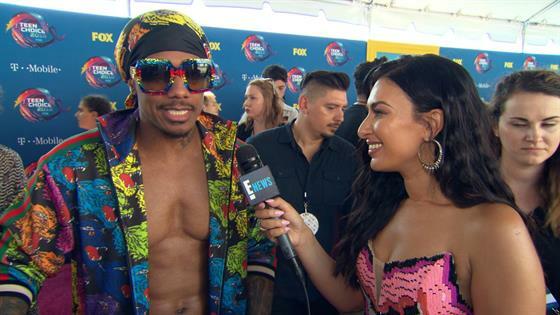 Nick Cannon is hosting the show, celebrating the year's achievements in comedy, fashion, film, the internet, music, sports and television; Lele Pons is serving as Cannon's co-host. Previously announced performers include Khalid, Lauv, Evvie McKinney, Bebe Rexha and Meghan Trainor. Nominations were revealed in two waves in June, and fans cast votes via social media. FOX is broadcasting the show live from The Forum in L.A. at 8 p.m. Nominees and presenters including Olivia Holt, Chloe Kim, Chloe Grace Moretz and Nick Robinson were among the first stars to hit the pink carpet. Meanwhile, the cast of Riverdale—including KJ Apa, Madelaine Petsch and Cole Sprouse—flew in just to attend the event. Flip through the arrivals gallery to see all of the red carpet looks, and tune in to Daily Pop tomorrow at 12 p.m. ET and E! News at 7 p.m. and 11 p.m. ET for comprehensive coverage.